I am so incredibly excited today. Because in exactly 7 days, my long anticipated new show, The Purpose Podcast will finally be launching! On the show, I interview guests who have encountered various types of adversity ranging from battling eating disorders, rebuilding after natural disasters, surviving sexual abuse, recovering from life-threatening diseases, and more. Each and every guest not only survived their adversity but thrived. This podcast is intended to inspire and motivate our listeners to live their very best lives and to reclaim the power of their own stories to do so. Sharing our adversity gives us the power to heal others, and ourselves. 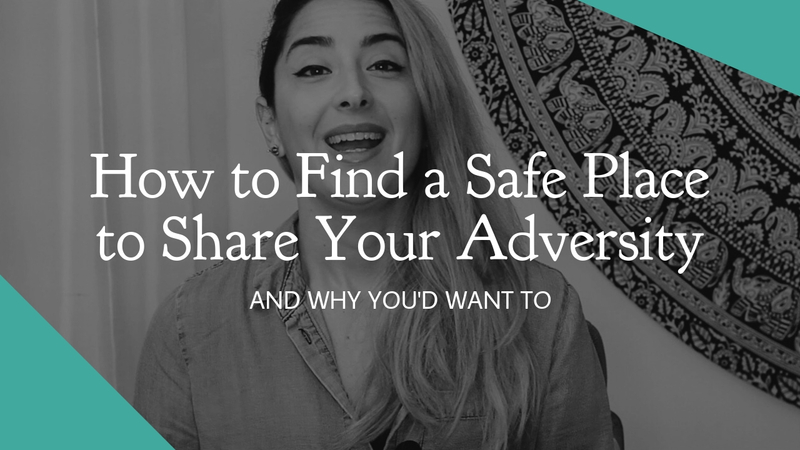 Today I created a quick video where I not only share what to expect in the lead up to the podcast launch, but also how you can go about finding a safe place so you can start sharing your own story of adversity and why you’d want to. You can view the video below. You can start sharing your own story of adversity by finding a support group in your area. To follow are a variety of links and resources that can help you in your search.Also don’t forget to try Google for your specific adversity, you may find more options in your area. I’d love to hear from you! What questions do you have about the Purpose Podcast or our guests? Leave a comment below, I’ll be answering the most popular questions in my next video on Wednesday this week. Corrie: In less than 24 hours, it’s going to be 2019. If 2018 was as difficult a year for you as it was for me, 2019 is our opportunity to start over and build a new life and set new dreams. But how do you find the inspiration to move forward when life has you at your lowest point? When experiences beyond your control changed life as you know it, and you don’t know what steps to take next? Today I’m excited to share my newest project designed to uplift and inspire anyone in the depths of adversity. My long anticipated new show, The Purpose Podcast, is launching one week from today on January 7th. Everyone has encountered trauma, but no one talks about it. For those who suffer, the stigma of sharing their experience can cause inaction in life and delay healing. On the Purpose Podcast, I invite you to join me and my guests and be prepared to be inspired as they share their stories. Our guests have survived incredible adversity and not only lived to tell the tale, but thrived as a result of it. Stories ranging from battling eating disorders, rebuilding after natural disasters, surviving sexual abuse, recovering from life-threatening diseases, and more will not only inspire you to view life in a new way, but motivate you to become the person you always dreamed of becoming. You’ll find the purpose of your trauma as we discover ours. I’m a survivor. In the last four years, I survived miscarriage, abuse, divorce, and the suicide death of my long-term post-divorce partner. I’ve also dedicated the last 6+ months of my work to inspiring others on a daily basis and have shared how I’m investing in my own personal growth. My hope is through this platform that by giving other people the stage to share their own stories of resilience, that together we can ignite healing in others and create mass positive growth in the world as we know it. How does one remain more positive in times of difficulty? The one consistent theme you will hear from all our interview guests is finding a safe place to start sharing your story. The easiest way I recommend starting to do this is to look for a local or online support group that’s dedicated to helping people who have experienced the same adversity as you. Groups exist for everything ranging from addiction recovery, divorce support, bereavement support, debt recovery, and more. I’ve provided several links and resources below this video that will help you find a support group that you can start attending in 2019 and start sharing your unique story. I’d like to hear from you guys… what questions do you have about the show? Leave a comment below. This Wednesday I’ll be back and am going to share an easy solution to getting through your hardest day. It’s a technique multiple guests on the show spoke of and that you can start using immediately to improve your mindset and well being. I’ll also answer any questions you have about the show. Thanks again for joining me today. Leave a comment or question below or on Facebook, Instagram or Twitter regarding the Purpose Podcast today and I’ll see you again on Wednesday.